Edgar Winter, Yes, Emerson, Lake and Palmer, Devo, Kraftwerk, P-Funk, Herbie Hancock, Jan Hammer, Gary Numan, They Might Be Giants and Bernie Worrell: These are just some of the many acts that wouldn’t be what they are today without the man below, Robert Moog. I’m almost guaranteeing an impromptu Moogfest sometime soon. So stay tuned for any announcements. 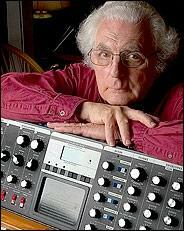 Rest in synthesized peace, Mr. Moog. Robert Moog, the creator of the electronic music synthesizer that bears his name and that became ubiquitous among experimental composers as well as rock musicians in the 1960’s and 70’s, died on Sunday at his home in Asheville, N.C. He was 71. The cause was an inoperable brain tumor, discovered in April, his daughter Michelle Moog-Koussa said. At the height of his synthesizer’s popularity, when progressive rock bands like Yes, Tangerine Dream, Kraftwerk and Emerson, Lake and Palmer built their sounds around the assertive, bouncy, exotically wheezy and occasionally explosive timbres of Mr. Moog’s instruments, his name (which rhymes with vogue) became so closely associated with electronic sound that it was often used generically, if incorrectly, to describe synthesizers of all kinds. More recently, hip-hop groups like the Beastie Boys and rock bands with more experimentalist leanings, from They Might Be Giants to Wilco, have revived an interest in the early Moog synthesizer timbres. Partly because of this renewed interest, Mr. Moog and his instruments were the subjects of a documentary, “Moog,” which opened in the fall of 2004. In an interview last year with The New York Times, Hans Fjellestad, who directed the film, likened Mr. Moog to Les Paul and Leo Fender, who are widely regarded as the fathers of the electric guitar. “He embodies that sort of visionary, maverick spirit and that inventor mythology,” Mr. Fjellestad said at the time. Mr. Moog’s earliest instruments were collections of modules better suited to studio work than live performance, and as rock bands adopted them, he expanded his line to include the Minimoog and the Micromoog, instruments that could be used more easily on stage. He also expanded on his original monophonic models, which played only a single musical line at a time, creating polyphonic instruments that allowed for harmony and counterpoint. In 1978, Mr. Moog moved from western New York to North Carolina, where he started a new company, Big Briar (later Moog Music), that produced synthesizer modules and alternative controllers - devices other than keyboards, with which a musician could play electronic instruments. His particular specialty was the Ethervox, a version of the theremin, an eerie-toned instrument created by the Russian inventor Leon Theremin, in the 1920’s, that allows performers to create pitches by moving their hands between two metal rods. It was the theremin, in fact, that got Mr. Moog interested in electronic music when he was a child in the 1940’s. In 1949, when he was 14, he built a theremin from plans he found in a magazine, Electronics World. He tinkered with the instrument until he produced a design of his own, in 1953, and in 1954 he published an article on the theremin in “Radio and Television News,” and started the R. A. Moog Company, which sold his theremins and theremin kits. Mr. Moog was born in New York City on May 23, 1934, and although he studied the piano while he was growing up in Flushing, Queens, his real interest was physics. He attended the Bronx High School of Science, and earned undergraduate degrees in physics from Queens College and electrical engineering from Columbia University. By the time he completed his Ph.D. in engineering physics at Cornell University in 1965, his theremin business had taken off, and he had started working with Herbert Deutsch, a composer, on his first synthesizer modules. Mr. Moog was familiar with the huge synthesizers in use at Columbia University and at RCA and that European composers were experimenting with; his goal was to create instruments that were both more compact and accessible to musicians. Using these modules, and others that Mr. Moog went on to create, a musician could either imitate acoustic instruments, or create purely electronic sounds. A keyboard, attached to this setup, let the performer control when the oscillator produced a tone, and at what pitch. Among jazz musicians, Herbie Hancock, Jan Hammer and Sun Ra adopted the synthesizer quickly. And with the advent of progressive rock, in the early 1970’s, the sound of the Moog synthesizer and its imitators became ubiquitous. In 1971, Mr. Moog sold his company, Moog Music, to Norlin Musical Instruments, but he continued to design instruments for the company until 1977. When he moved to North Carolina, in 1978, he started Big Briar, to make new devices, and he renamed the company Moog Music when he bought back the name in 2002. He also worked as a consultant and vice president for new product research at Kurzweil Music Systems, from 1984 to 1988. His first marriage, to Shirleigh Moog, ended in divorce. He is survived by his wife, Ileana; his children, Laura Moog Lanier, Matthew Moog, Michelle Moog-Koussa, Renee Moog and Miranda Richmond; and five grandchildren.